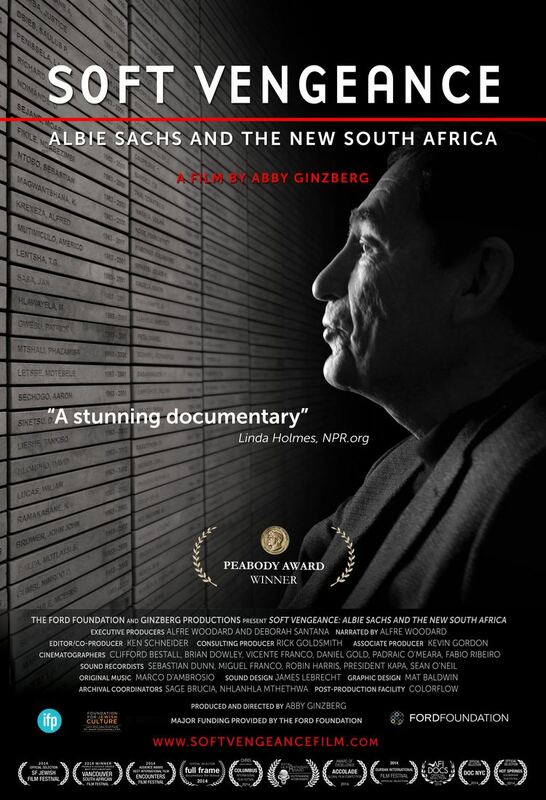 Soft Vengeance a Peabody-award winning film, paints a portrait of Albie Sachs, a lawyer, writer, art lover and freedom fighter, set against the dramatic events leading to the overthrow of the apartheid regime in South Africa. Shining a spotlight on Albie’s story provides a prism through which to view the challenges faced by those unable to tolerate a society founded on principles of slavery and disempowerment of South Africa’s majority black population. As a young man, Albie defended those committed to ending apartheid in South Africa. For his actions as a lawyer, he was imprisoned in solitary confinement in Cape Town, tortured through sleep deprivation and forced into exile. In 1988 he was blown up by a car bomb set by the South African security forces in Maputo, Mozambique, which cost him his right arm and the sight of one eye, but miraculously he survived and after a long year of rehabilitation in England, he recovered. Returning to South Africa following the release of Nelson Mandela, Albie helped write the new Constitution and was then appointed as one of the first 11 judges to the new Constitutional Court, which for the past 24 years has been insuring that the rights of all South Africans are afforded protection.